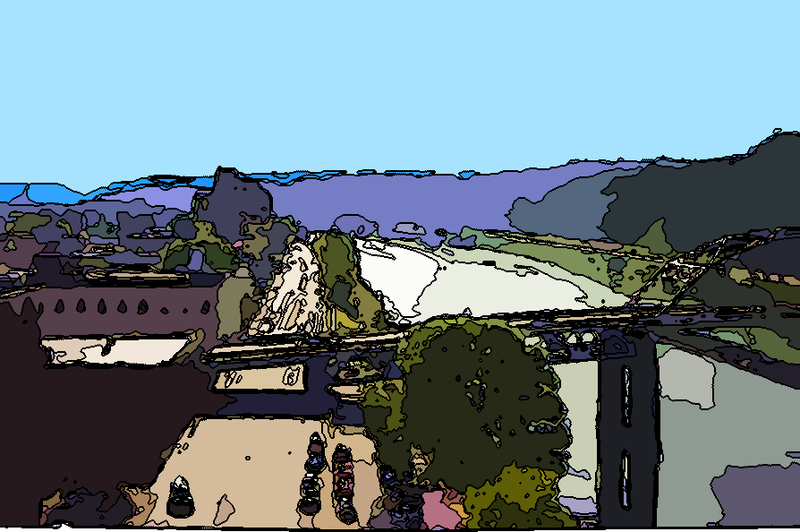 This week’s art, another in my pretentious “Pop Art Charleston” series, is a view of the South Side Bridge ramp over Kanawha Boulevard. Here’s a special bonus RFC song. Just about 27 hours before this message is being posted, we recorded Parkersburg singer/songwriter John Radcliff at LiveMix Studio for episode 16 of Radio Free Charleston. Some of you old-timers may remember John’s amazing guitar work with The Swivel Rockers, Feast of Stephen and The Mad Scientist Club. About six years ago, he started writing and singing his own material, and I was blown away by the quality of his tunesmithery. Look for the full episode at Gazztv Monday, and detailed production notes right here in PopCult. Cool Thing Of The Week: SHAZAM! If you’re a fan of the Original Captain Marvel, known by his magic word “Shazam” to most folks, then this is the best of times and the worst of times. 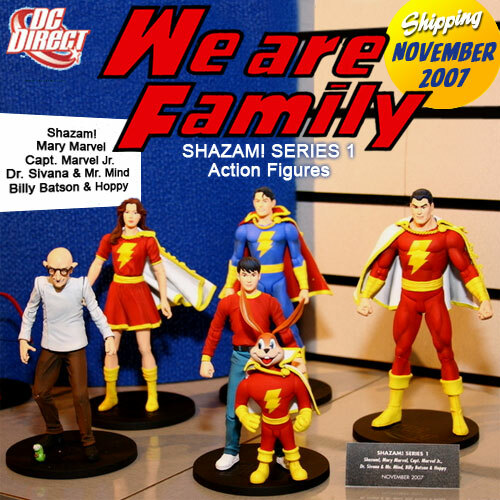 We will ignore the god-awful “grim and gritty” re-imagining of the Shazam family of characters currently being inflicted by my least-favorite comic book writer, Judd Winnick (of MTV’s “The Real World.” He was the guy that made you like Puck in season three). Aside from that abomination, there are very cool things afoot with my favorite super-hero, The Big Red Cheese. 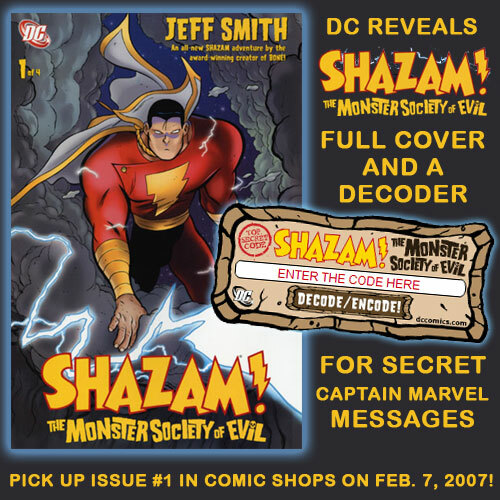 Jeff Smith, the cartoonist behind the amazing “Bone” comic books, is producing a four-issue mini-series that takes the Shazam characters back to their roots and re-tells a classic adventure in “Shazam: The Monster Society Of Evil.” This series restores the sense of wonder and light-hearted adventure that was the hallmark of the Captain Marvel stories of the 1940s, when he starred in the best-selling comic book of all time, with sales of six million copies every three weeks. The series even has a secret message in each issue that has to be decoded at the DC Comics Website. …until the first opera/musical based on the life of Anna Nicole Smith is announced. You know there’s got to be a dozen or so ironic pop culture mavens out there cranking out a quickie cash-in job, disguised as a hip, irreverent social commentary. Last week our Monday Morning Art was a digitally-assaulted photograph of The Union Building, taken from Capitol Street. This week we turn the tables with a digitally-assaulted photograph of Capitol Street, taken from The Union Building. If you look about a fourth of the way up from the bottom, just left of center, that’s where I was standing when I took last week’s photo. It was not the only time I’ve been just left of center. 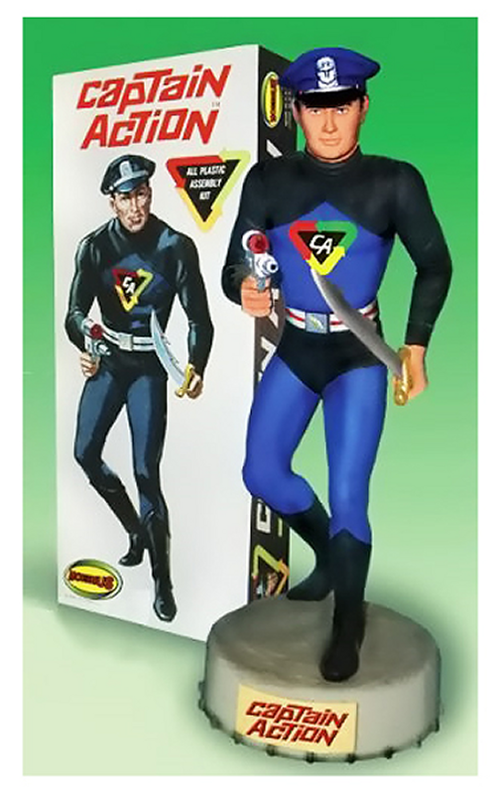 When I was a kid, my favorite action figure was Captain Action. He was a GI Joe-sized toy figure that could be dressed as other superheroes like Superman, Spider-man, Batman, Green Hornet, Captain America, and many others. Our cool thing of the week this week is an upcoming reproduction of the hard-to-find Aurora Model Kit of the Captain, which you can read about here. It was one week before Valentine’s Day, and I have to say, no matter how many strange things you’ve lived through, nothing can quite prepare you for the sight of your girlfriend being handcuffed to a professional wrestler. That’s my Valentine, Melanie Larch on the right, handcuffed to IWA East Coast Mega-star, Crowza at last week’s “A Need To Bleed” event in South Charleston. Mel’s a noted area singer (She’ll be featured in the West Virginia Symphony Orhcestra’s production of “Carmen” in May, and you can see her singing “Ave Maria” on episode 11 of Radio Free Charleston, and at this link). She has no previous professional wrestling experience, at least not as a participant. One of the things I enjoy most about IWA East Coast shows is the surreal nature that they tend to take on. Thanks to IWA East Coast and Nick Gatens for the photos.